The Kashmiri region of India is known for the abundance of meat in its cuisine. 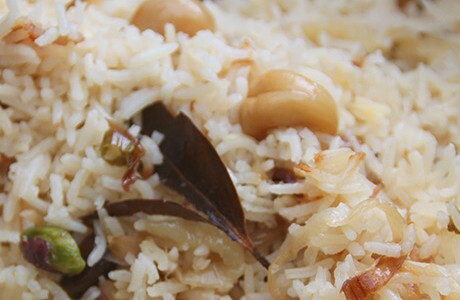 This vegetarian version of Pulao rice uses a combination of authentic spices to create a delicious dish. In a small bowl, soak the saffron strands in milk or warm water and set aside. Heat the butter or ghee in a saucepan which has a lid. Add the bay leaves, cloves and cardamoms, and mix ensuring that they do not burn. Tip in the onion and fry for 5-7 minutes until golden brown. Add the chilli and fry for a minute. Mix in the garlic, ginger and salt add the sultanas, cashew nuts and almonds. Fry for a minute and then fold in the rice. Add 650ml of just boiled water to the pan and cover. Stir in the saffron mixture and simmer for 10 minutes until the rice is cooked. Serve hot with dal or a chicken curry.